Our paleo-friendly, protein-packed jerky, bars and sticks come in bold, up-in-your-grill flavors and are made with nothing but organic, whole food ingredients. There's nothing mightier than meat from cows that eat as nature intended. Our 100% grass-fed cows roam free. Our ingredients are clean. And you won't find antibiotics, artificial hormones or GMOs anywhere near 'em. Mighty chicken might seem like an oxymoron, but don't tell that to our organic, free-range birds. Their meat is leaner, meaner, and cleaner than anything else you'll find hanging from a peg in the checkout aisle. It all starts with our land. 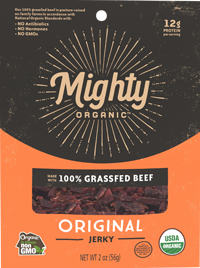 Our beef comes from 100% grass-fed organic cows raised in the Australian Outback. Our chicken comes from family-owned organic farms spread all across the American midwest, from the vast plains of Kansas to the river valleys of the Wisconsin Driftless.